I disagree. This is Apple once again pushing things forward towards wireless audio. Whenever they've done this they've always left some people behind and justifiably angry about it. But that's the way it goes with technology. It doesn't matter whether it can still physically fit or not, if it does not "fit" into whatever Apple sees as the future, they'll leave it out. I remember when I got that first iMac... No ADB, no SCSI, no floppy. I had to buy an ethernet card for Mac SE, and use it as a server so I could print on my old printer, backup files onto my external HD, and save files onto a floppy for sharing. Then why does the brand new MacBook Air still have a headphone jack, rather than putting a more useful USB-C port on both sides? Excellent question. I'm looking one right now and wondering the same thing. My wife uses her wirelss Airpods and any line out requirement is long since past with USB-C and a multi-function dongle. This is not a knock on Apple hardware in any sense of word, they have delivered in spades. It's the software vendors who have not tapped the potential the iPad Pro has to offer. I think a lot of that has to do with the software pricing differences between desktop and iOS. Being able to use subscription pricing within iOS is going to help nudge that along. That's probably the primary reason full versions of things like Photoshop or AutoCAD are being announced. Vendors that didn't have legacy desktop software were more likely to support full versions of their apps in both macOS and iOS because they were already doing bargain pricing for desktop to compete. There is a historical bias to perceive iOS apps as being lower capability and downscaled because earlier iOS devices were indeed less capable than macOS devices and older apps had to accommodate the platform. Now that Apple is shipping iOS devices that exceed the raw performance of some macOS devices the old perceptions no longer apply. The last couple years of iPad Pro releases have accentuated the impedance mismatch that now exists between the iPad Pro's hardware and software capabilities. If the iPad/iPad Pro is truly the future vision of personal computing this was bound to occur at some point and that's where we are today. The fact that you can now kit out an iPad Pro at prices that give MacBook Pro buyers pause only amplifies the current mismatch situation. Apple has some more work to do to bring its ecosystem along for the ride if the future vision is indeed centered or heavily biased around the Pad. Some of this will involve pushing and some of this will involve pulling. Having a brutally fast iOS hardware offering is part of the pull, as is having full featured no-compromise iOS software apps available. The push side will require a lot more finesse and may require some tough choices about how Apple decides to invest between iOS and macOS. Nothing huge will happen overnight, but longer term Apple has to come up with a more cohesive solution. Perhaps macOS becomes a server solution and iOS grows into a full fledged client solution, with all the UI capabilities one expects on a full/fat client computer. Or not. * Here is a common use situation; using a headphone jack and charging the iPad at the same time. - I would be OK with the new iPad Pro if it had two USB-C ports (so one for a headphone dongle and the other for a charging cable). - But needing a USB-C hub just to use headphones and charge the iPad is ridiculous. Wireless headphones are far a more common scenario than needing both wired headphones and power at the same time, I’d imagine. And if they aren’t, they will be. Yes - there really isn't a justification for not including it in the iPad They had some pseudo-reasons that didn't really hold up with the iPhone, but even those don't apply with the iPad. Especially now when they ostensibly are going to be using the USB C port for more functions. I too find this annoying, but in fact there is a justification. The classic headphone jack is too fat to fit under the screen, given how thin the device is, and now with the bezel so small, there's no room outside the screen area either. You might well argue that they should make it thicker, and add more battery and/or cooling at the same time... that's a legitimate design choice, though, and not just a mean decision to take something away from us. For most people, bluetooth is the answer (and a good one, these days). For a few people (say, a million or so DJs around the world), it's bad. But they should probably be buying the non-pro iPads anyway. Yeah, I don't know about that. Sure it makes sense on one level, but not on another. Is there really nothing they could have done to include the 3.5mm headphone jack? And barring that, how about at least making an option to use an adapter for audio when the USB-C port is in use? The SmartConnector is sitting right there, ready to deliver audio, power, data, whatever if Apple chooses to engage it. But let's go back to the suggestion that there's no room for it. 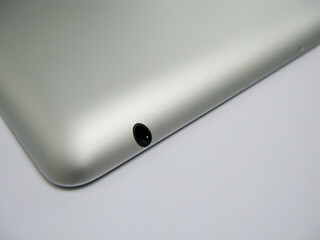 Now assuming that's so ... currently the headphone jack on the old iPad design sits on a very dramatic curve of the back of the iPad, which means much of the jack is exposed on one side. If the jack were placed on a similar dramatic curve on the corner of the iPad, it would be similarly functional to its current placement, and easily fit behind the bezel, with no less of a design compromise than it currently exhibits. And that's assuming there's even a need to do this. I'm not an engineer, maybe you are. 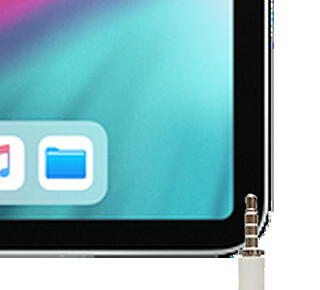 But either way, I don't think we know yet what the internal tolerances are on this iPad to say one way or the other that there's no room for a headphone jack, nor that Apple could not have found a way to accommodate it, aside from the one obvious method I have observed above. But this isn't just about a million or so DJs either. It's about any musician, or music producer, amateur or professional, who want to use the iPad to create music. It's also about any gamer who wants to play games in real time with other players. That's potentially a lot of customers who have lost one of the most convenient aspects of the iPad, something its portability and size made it enticing for these purposes. Is it the end of the world that the jack is gone? No. But it's also harder to just use it for these purposes in a casual way. Forgot your dongle, running low on a charge? Guess you won't be doing an impromptu recording when the mood hits, or engaging in a video game -- at least on a level playing field due to audio lag. As a musician, I find the loss of the mini jack an inconvenience. As a professional, my job has always been to work around the inherent limitations of my tools. As a professional musician, I can tell you that the loss of the mini jack is not that big a deal. Really, it isn’t. If I were tempted to record via the mini jack, I’d just as soon use the built-in microphones. On the iPhone Xs, they sound surprisingly good. Anything more than that, and a cheap class-compliant USB interface is the way to go. Oddly, the web is full of instructions for how to pair Bluetooth headsets with a Mac. They usually involve going into the System Preferences' Sound control panel and selecting the headset for input and output. For some reason my reply to this disappeared. Those instructions are, as far as I can see, either for headphones only, or they're nonsense. I've tested five different headsets on three different OSes and five different Mac models, ranging from MBP2012 to MB2016. None of them ever worked. And I finally spent some time messing with the Audio MIDI Setup utility today, with no luck. It looks like you can't get an inbound audio channel from a BT device while there's outbound audio going to it. Just to clarify: I can play music and other audio over the headsets. And I can even record audio from the headset - using QT Player, for example. But I can't do them both at the same time. If the device is getting audio, the mic is dead. Also, the BT stack seems very flaky. Fiddling with setup using the Audio MIDI app killed BT completely until I turned BT off and back on again from the Pref pane. All of the tested headphones worked fine with a variety of iPhones, so this isn't anything fundamental to MacOS.